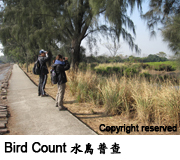 Counting waterbirds is important as it enables us to learn just a wetland is. In addition, however, the natural world is in a constant state of change, and wetlands are no exception. These changes affect the plants and animals living there, including birds. Repeated counts of waterbirds allow us to monitor any changes that might be occurring in terms of the number or distribution of birds present, and the number of species. If changes are identified, any necessary action may be taken to reverse a negative change, or support or enhance a positive change. Thus, waterbird counts provide one part of the basic data upon which the organisations who manage wetlands can base assessments of the work that needs to be carried out. This work might be direct management of the habitat, or it might be activities that attempt to influence government or other bodies to change practices that are affecting the wetland.